This is how I start my day: A bowl of fresh berries and a big mug of hot coffee. 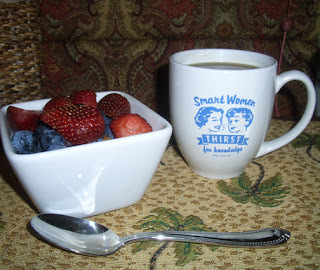 I love my "Smart Women THIRST for knowledge" mugs that Karry gave to me for my birthday one year. They inspire my day...and probably lead me to drink too much coffee. Today my mug was filled with delicious Hawaiian coffee that Kerry brought back from her trip. I hope your day started off as well as mine did. While Rachel and the girls were out, I decided to fill you in on my stay here. I hope she doesn't mind that I used the computer. Today I played with my baby--you can see it in the picture. I also took a nap. I also chased some squirrels. Oh, Molly gave me a treat, and Mary brushed my fur. I think it was the best day ever! p.s. I miss my family. I wonder when they come home. We have a guest in the house this week. 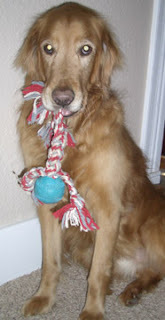 Kerry's dog, Blue, is staying with us while she and her family are vacationing in Hawaii. Honestly, I was a little concerned about dog sitting when she asked us if we would be interested. My younger daughter, Molly, has had an unreasonable fear of dogs since she was about one year old. She would cry and tremble if a dog even sniffed at her. We never knew what caused her fear. Some suggested it was from a traumatic experience, some suggested it was because the dogs were as big (or bigger) than she, others said it must be from a past life. Whatever it was, she has never felt comfortable with dogs. Blue has been a stellar house guest. 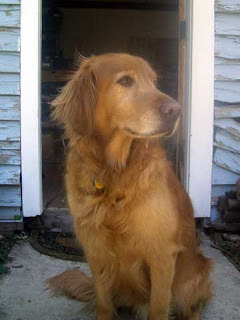 He is a very mellow, gentle Golden Retriever. Even though Molly has known him for years, she never really warmed up to him, until now. She adores him! The first day he was here, I found her cuddling with him while she watched her Saturday morning cartoons. This is a wonderful experience for all of us. I have even caught myself wondering when we might get a dog of our own. The babies have arrived. 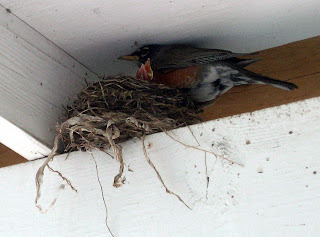 By our count, there are at least two very hungry robin chicks in the nest. The mama robin is doing her job bringing lots of worms and protecting these tiny chicks. 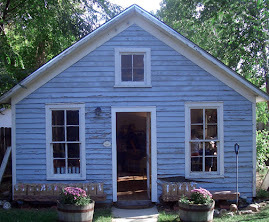 Here is their first photo. The other three nests she built must have been "practice nests" She stopped sitting on them a few weeks ago, and directed all of her attention to this one. I will keep you posted if there are futher developments.